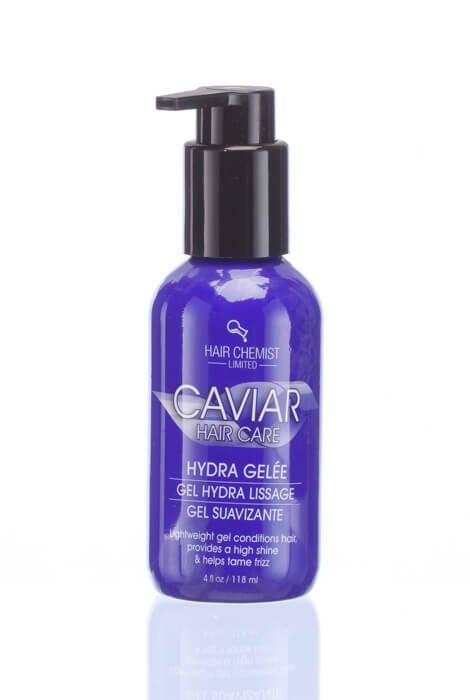 Caviar Hydra Gelée is a lightweight styling gel that conditions hair, boosting shine and taming frizz. The luxurious conditioning gel contains real caviar extract for lavish, weightless hydration. Use on damp hair prior to styling or on dry hair as a finishing styler. Propylene Glycol, Cyclopentasiloxane, Water(Aqua), VP/VA Copolymer, Caviar Extract , Passiflora Edulis Seed Oil, Helianthus Annuus (Sunflower) Seed Oil, Euterpe Oleracea Fruit Oil, Phenyl Trimethicone, Oryza Sativa (Rice) Bran Oil, Saccharomyces/ Copper Ferment, Saccharomyces/Iron Ferment, Saccharomyces/ Silicon Ferment , Rubus Idaeus (Raspberry) Fruit Extract, Saccharomyces/Magnesium Ferment, Verbascum Thapsus Extract, Dimethicone/Vinyl Dimethicone Crosspolymer, Salvia Officinalis (Sage) Leaf Extract, Urtica Dioica (Nettle) Extract, Saccharomyces/Zinc Ferment, Isohexadecane, Lentinus Edodes Extract, Rosmarinus Officinalis (Rosemary) Leaf Extract, Polysorbate 80, Ganoderma Lucidum (Mushroom) Extract, Equisetum Arvense Extract, Sodium Acrylate/Sodium Acryloyldimethyl Taurate Copolymer, Fragrance.